Since I missed my connection and I'm spending New Year's in an airport hotel, I figured I'd take this time when everyone is out celebrating to point out something I know is unpopular, but which still annoys me. We are accustomed to thinking of government transferring money from the well off to the poor. Here it was the poor and average transferring money to the rich. But was it really? It was the government transferring money to the rich, that's for sure. But where does the government get its money? Mostly from....the rich. According to the Tax Policy Center, the top income quintile pays 67.2% of all federal taxes; people who make over $100K/year pay 73% of all federal taxes. When it suits their argument, pundits like Stiglitz suddenly forget that we have a progressive tax system. I'm not saying the bailouts weren't unfair (they were), or that the middle class hasn't suffered for the mistakes of others (they have). I'm just saying, let's stop pretending like the majority of the bailout is being financed by Sally Schoolteacher. It isn't. But isn't the share of taxes paid by any income group irrelevant without context? 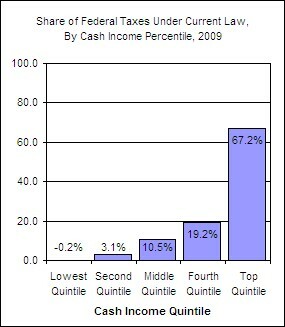 As a thought experiment, let's say the top 10% paid 67.2% of the taxes, but collected 90% of the income. Then that would be a regressive tax system. Of course, the number isn't 90%, but I believe it is roughly on par with the percent of taxes paid, which would suggest that tax system isn't really progressive in practice. Isn't it still pretty much up in the air as to who will be paying for the bailout since most of it is being financed via debt at this point in time. I don't disagree with the overall point of the post but the reality is that an enormous liability has been created to fix Wall Street and the method for liquidating the debt is still pretty much up in the air. Bottom line, the banks were rescued on the backs of some future tax payers but we just don't know which ones yet. Such statistics refer only to the federal income tax. When considering all of “this nation's taxes” including payroll, state and local levies, the top 5 percent pay just 38.5 percent of the taxes. Now, before saying that this is "excessive", consider this: According to the data, the wealthiest 5 percent of America pays 38.5 percent of the total taxes precisely because they make just about that share — a whopping 36.5 percent! — of total national income. Even if we accept your statistic as being the right way to look at this situation your conclusion is still wrong. We at the bottom 99% are paying an undue amount of the bailout due to the fact that there will be less money for schools, police, firefighters, sewers, roads, etc. Our lives will be disproportionately affected and this is the real cost of the bailout. Looking merely at dollar amounts is not the right to analyze this. The top 1% will always be able to afford security, clean water, etc. The projected cost of TARP has shrunk from a few 100 billion to 42 billion, and I believe that is an analysis of principal only. When interest income and warrant proceeds are included, it just gets better. The Federal Reserve is likely to make a profit on its lending facilities. The taxpayer is probably going to get his biggest bang for a buck in an emergency situation since WW2. We have a progressive tax system. Which means that though the people who earn the most pay a higher percentage in taxes, Sally Schoolteacher's taxes are being used to prop up a financial sector that reaped enormous profits on the road to ruin. And this financial sector, still utilizing all the tools and loan guarantees available to "bank holding companies," is poised to pay out some of the biggest bonuses ever in 2009, the year when employment tanked in America. Concurrently, Sally Schoolteacher's pension fund has vanished, especially if she worked in the Kenosha, WI school district. Tom Lindmark: Strictly speaking, you're right. I'm assuming that the makeup of federal tax revenues will remain roughly the same in the future (which I think is reasonable, since the makeup has been around this level for ~20 years now, and Obama has promised no middle class tax hike). Cetamua: The numbers I used were for all federal taxes (including payroll taxes), not just income taxes. I didn't use state taxes because it was the federal government that put up the money for the bailout, not state governments. X=Y: I'd characterize what you're talking about as the cost of the recession. I was referring to the cost of the bailout specifically. Anne: Sure, like I said, I'm not denying that the bailout was deeply unfair. It was. It's just the strict factual issue that annoys me. I'm also not trying to make any sort of larger point. This is just one of those random things that annoys me. "I'm assuming that the makeup of federal tax revenues will remain roughly the same in the future (which I think is reasonable, since the makeup has been around this level for ~20 years now, and Obama has promised no middle class tax hike)." Maybe a reasonable assumption and possibly not. Since marginal revenue tends to decrease rather markedly as marginal rates approach certain levels, it's not unreasonable to assume that there isn't that much left in the golden goose of the upper quintile. They do have alternatives to forking over increasing amounts of money to the government. That sort of calculation might be behind the talk of a VAT or something similar. It seems to me the reality is that when massive new sources of revenue are needed the only place to raise them is through a broad based levy. In that case, Sally Schoolteacher might well be in line for her share of pain. Fun fact on taxes: 47% of American households either pay zero in Federal income taxes, or else they receive refunds that exceed the amount held back in withholding. If Sally Schoolteacher has two kids and files as Head of Household, between Earned Income Credit, Child Tax Credit and Additional Child Tax Credit, Sally will pull several thousand dollars out of the Federal treasury. That's hardly a surprise. It's a deliberate result of many of the welfare reform efforts over the past few decades, which shifted away from direct assistance (ADFC and direct housing subsidies, for example), to manipulations of the tax system like the Earned Income Tax Credit and the Low Income Housing Tax Credit. That kept the revenue streams out of the government's administration, but had the side-effect of greatly reducing the net income tax paid by many Americans that had previously received direct assistance. But if you'd like to reverse that trend, feel free to propose ways to do so. I can think of a few myself. In theory, at least. But usually when people are referring to the progressivity of the tax system, they aren't comparing a certain segment of society's percentage of aggregate income earned with the percentage of taxation paid on that- they're simply noting that higher income Americans tend to pay a higher tax rate. You can look at that way -- although its somewhat misleading. The Top 20% owns 81.6%. So its no surprise that the bottom 40% of the population -- they own all of 0.2% of the wealth, according to the Congressman -- pay no taxes. Libert pointed out, looking at the percentage share of taxes paid by any income group without any context is an irrelevant statistical ploy. Stiglitz' new book, Freefall, does a great job of explaing the past and proposing some solutions for the future in readable langauge. I find my self in agreement with the historical parts, and some of his perspectives are worth serious analysis for future. It is, however, another nail in the supply side coffin and in the oversimplified trust that industries can regulate themselves. I saw an article in the communist Forbes magazine about the top 400 income earners of 2006, they ended up paying 17% of their earnings to federal income tax. 17%? I am sure at their income, their FICA is just a drop in the bucket. Counting my wages + FICA, I wish I only paid 17%. Even if you go to the top 1%, they only pay less than 2% higher than the median. The people who get soaked are those between 90K and 250K. But above that, the federal taxes get less and less progressive. Are you talking about "federal taxes" or federal "income taxes"? Don't forget that state taxes are absurdly regressive. Fica is regressive. Medicare is regressive. I believe these statistics are misunderstood. Every business (and employee) owes its income to a consumer somewhere, directly or indirectly. For every dollar spent in the shops part of it is a sales tax, part is due to taxation of the relevant sales and production business, and part is due to their payroll taxation. All of these tax costs are incurred in proportion along the supply chain and the bill is handed down to the final consumer, who buys with the spending money remaining in his pocket. Income taxpayers are led to believe that it is a tax paid by them personally, but can you see that they are really unwitting tax collectors merely forwarding money to government that is received from consumers of their work? It should be more widely recognised that income tax is akin to a tax on your work to be paid by buyers of your work, otherwise adding up the amounts of tax paid on income and expenditure will be found to exceed that which the exchequer actually receives. Thus, net pay after tax is what we earn and it is that which is taxed when we consume. Implicitly, there is an effective flat tax on consumption of say 30% or more in the US. So if there is an increase in aggregate taxation by taxing the rich more then on average everyone will find an increase in the tax content of his consumption. The conclusion is that income taxes are neither necessary nor do they serve any useful purpose whatever other than to hide the true level of taxation inflicted on us and to mislead the voters as to who bears their burden. We don't have a very progressive tax system. Warren Buffett pays a lower tax rate than his secretary. In actual practice, the superrich pay a lower percentage of their income in taxes than the upper middle class. You can look at the stats. You haven't. So you are dead wrong, and the people you're criticizing are.... also wrong. In fact, the government routinely takes from the middle class to give to the rich. It can't take from the poor. They have no money. "Cetamua: The numbers I used were for all federal taxes (including payroll taxes), not just income taxes." You err by only looking at the top quintile. The tax system is progressive up to a *point*. Look at the finer-grained numbers. The top 10%, the top 5%, the top 1%, the top 1/3 of 1%. You'll be shocked. The system simply stops being progressive and goes regressive when it hits the super-rich. "Since marginal revenue tends to decrease rather markedly as marginal rates approach certain levels, it's not unreasonable to assume that there isn't that much left in the golden goose of the upper quintile." Actually, it's extremely unreasonable. If you actually look at the allocation of wealth, there's a lot of money there. We've had much higher income tax rates, and the marginal revenue return was very high. The marginal revenue return on high top rates starts to drop once *the society is more equal*. This is why high top rates raised a fortune during the Woodrow Wilson administration (high inequality, like today), and didn't during the Eisenhower administration (much higher equality). Since high top rates *cause* greater inequality, this is sort of a "self-correcting" situation. However, *right now* there is a huge amount to be made by raising rates on the richest. Since high top rates *cause* greater equality, this is sort of a "self-correcting" situation. However, *right now* there is a huge amount to be made by raising rates on the richest. "All of these tax costs are incurred in proportion along the supply chain and the bill is handed down to the final consumer, who buys with the spending money remaining in his pocket." Absolute nonsense. Why? It ignores supply and demand. In healthy markets, the price is driven by competition, so businesses *cannot* pass on all tax costs -- some of it comes straight out of profits. Anyway, irrelevant to the progressivity of the income tax. Taxing Bill Gates personally has no meaningful effect on consumer spending whatsoever, but could be a huge boost to the federal budget. Thank you. This amounts to a competent analysis for a change. This response is quite common. This is not a theoretical matter. Strict accounting reveals, as any business owner can confirm, that the totality of taxation of business and employees is met from the proceeds of business sales ultimately to individual consumers. If the proceeds of sales, less the accumulated costs of taxation, are insufficient to meet the costs of production and profits in the supply chain then that would indicate an unsustainable business model. That a thriving market persists is an indication that those costs of taxation are being met by consumers and that includes everyone rich or poor. it is really an amazing, stunning, easy and genuine online video of your good plan. I am a real supporter of one's function! I'd personally take a bite involving treat off of any sapling everyday. D3 Gold Sale it takes strength to be polite to someone when that person has been rude to you, D3 Gold it takes strength to persist in the face of obstacles, when it would be much easier to simply give up Buy D3 Gold, It takes strength to do what must be done when the work is unpleasant and uncomfortable. The consequences of today are determined by the actions of the past scarlet blade gold. To change your future, alter your decisions today scarlet blade gold, Experience is a hard teacher because she gives the test first, the lesson afterwards scarlet blade gold, but it takes character to keep you there. Anda ingin tau tentang kesehatan wanita? kesehatan reproduksi wanita? kesehatan organ intim wanita? Ingin Tahu Lebih Rinci Tentang Keaslian Crystal X?. Anda dapat mencari tentang kesehatan di situs ini, anda juga mendapat informasi tentang CRYSTAL X ASLI Murah! Hanya Rp 65.000,- Ayo Buruan!. Selain tentang kesehatan organ wanita, anda juga dapat menemukan tentang bahayanya bagi kesehatan yakni 5 Efek Samping Crystal X. Agar tetap sehat dalam memakainya, pastikan membaca Tanya Jawab Tentang Crystal X. Jangan abaikan kesehatan organ intim, dapatkan info melalui Tentang Crystal X Asli NASA. Fakta-fakta yang membuat anda sehat juga dierlukan Fakta Tentang Crystal X Asli NASA . Jangan lupakan efek samping agar miss V tetap sehat dan bersih, baca 5 Efek Samping Pemakaian Crystal X. Lalu jika produk ini terjatuh Crystal X Asli NASA Terjatuh dan Patah. Pastika juga demi kesehatan anda, anda memastikan bahwa itu adalah Crystal X Asli NASA. Anda juga bisa membaca tentang 5 Ciri-Ciri Keputihan Karena Penyakit Berbahaya. Lalu caramengobatinya juga tersedia Cara Mengobati Keputihan Secara Cepat dan Praktis. Masalahnya adalah apa dampaknya untuk kesehatan Crystal X, Dampaknya Bagi Kesehatan?. Apa tanggapan mereka, Mereka Yang Sudah Pakai Crystal X. Jadi makanan yang harus diperhatikan bisa dibaca disini Makanan Yang Harus Dihindari Penderita Keputihan. Jangan lewatkan juga testimoninya Manfaat dan Testimoni Crystal X Asli. Apalagi yang satu ini Crystal X Asli dari PT. Natural Nusantara (NASA). Untuk mengetahui manfaatnya bagi kesehatan Apa sih Manfaat dan Fungsi CRYSTAL X ASLI?. Pokoknya ada di situs kesehatan organ intim/miss V bagi wanita disini crystal x. Kalau sudah, cara ordernya disini Cara Order crystal X. Tambahan info untuk Anda semua, Cara Mencegah Kanker Serviks. Thường xuyên bổ sung Vitamin C cho cơ thể, giúp bạn tránh được các bệnh về cảm cúm, hoặc các bệnh về máu do thiếu vitamin C. collagen nhat ban Ngoài ra Vitamin C là chất cần thiết để tạo nên collagen, giúp tăng cường mức độ chất chống oxy hóa trong cơ thể. Chúng ta đều biết cà chua chứa lượng lớn lycopene.uống nước collagen thì mới có hiệu quả mọi vấn đề làm đẹp đều được chúng tôi tư vấn miễn phí nếu bạn đang phân vân một điều gì đó hãy đến với chúng tôi Nhưng không phải ai cũng biết lycopene giúp loại bỏ men collagenases, một loại men phá hủy cấu trúc collagen. Để tận dụng hết lợi ích của cà chua, nên nấu chín hơn là ăn sống. Các loại rau có lá màu xanh đậm được biết đến với sự giàu dinh dưỡng. Khi sử dụng các loại rau này hằng ngày, các tác nhân trong chúng giúp cho quá trình sản xuất collagen xảy ra nhanh hơn. Các loại rau điển hình mà chúng ta có thể sử dụng như cải pó xôi, măng tây và bông cải xanh.phụ nữ sinh mổ cần ăn gìcác mẹ sinh mổ nên chú ý đến phần dinh dưỡng cho mình nhé, bởi sinh mổ tốn rất rất là nhiều máu cũng như làm giảm sức khỏe của các mẹ vì thế hãy ăn những chất bổ cho sức khỏe của các mẹ để nhanh chóng bình phục mà chăm sóc bé nhé Các loại rau này không những giúp sản xuất collagen, chúng còn giúp cơ thể sử dụng collagen hiệu quả hơn. 2016 at 5:30 PM PT / 8:30 PM ET. Super Bowls 2016 Live Stream || Free Panthers vs Broncos Super Bowl 50 Live Online Streaming, Info Mega NFC Event Telecast From Feb.
7, 2016 at Levi’s Stadium in Santa Clara, California. Stadium in Santa Clara, California will have Super Bowl 50 in the middle of Carolina and Denver on Sunday, Feb. 7, 2016 at 6:30pm ET. Danke, dafur dass Ihr jeden Tag mit uns die Hl. Messe gefeiert habt, fur all die Reparaturen im ganzen Haus Jeux De Friv 10 Jogos Friv 2018 Jogos Friv 2019 fur Euere Bereitschaft Juegos Friv 10 Juegos Friv 20 Juegos De Friv 2 immer zur Verfugung zu stehen Juegos Geometry Dash Juegos Twizy Twizl Gratis Danke, dass Sie Ihr Muhen um den Aufbau des Leibes Christi mit uns teilten.